Are you ready for some foooooooooooooootball??? Sundays, football, friends, family and FOOD. Personally, I am all about the food but... some are in it for the game, right? Is there any particular snack, meal or drink you just HAVE to make when football season hits? Personally, I am all about the snacks- dips, sandwiches, salads, wings, you name it- it's on. Or are you about the meals? Making pizza or grilling meat. 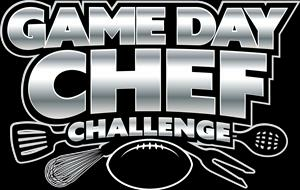 It's your lucky day because the Game Day Chef Challenge is back for its second year! Ready to show off your mad game day cooking skills? Head to your local Chevron or Texaco station, pick up ingredients and whip up a mean recipe for a chance to win $25,000 in Chevron gift cards! Head over to www.thegamedaychef.com to enter (entries will be accepted until September 30, 2015) and read the complete contest rules. The Game Day Chef Challenge is open to residents 18 and older residing in Alabama, Arizona, California, Florida, Georgia, Idaho, Louisiana, Mississippi, Nevada, New Mexico, Oregon, Tennessee, Texas, Utah, Washington and Wyoming. Of course, don't forget to keep up with Game Day Chef fun and stay up to date by liking them on Facebook, and following them on Instagram, Pinterest, and Twitter. However... I do have a contest for YOU here on MY blog.